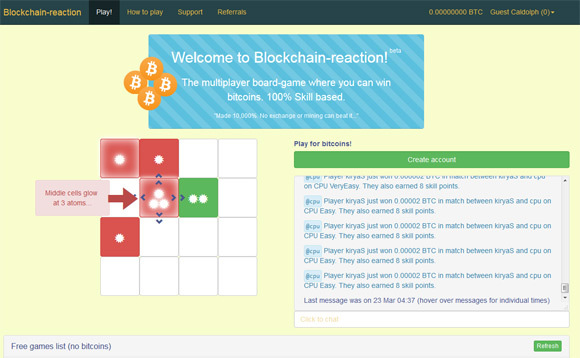 The game Blockchain Reaction is a multiplayer board game where your objective is to eradicate all other colors from the board and when you do so you win some Bitcoins. The game is 100% skill based, weather you play it against the CPU or against other players, so it is up to you to either win or loose. 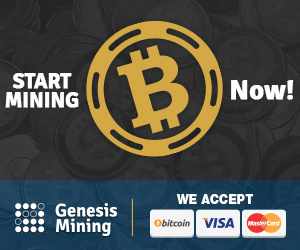 You can start by playing completely free to get to know the game and get used to playing the right way, before you can more to playing for Bitcoins. There is no need to register just to try the game, you are ready to give it a go as soon as you open up the website. There is a simple tutorial to get you started and you can then choose a list of games waiting for players to join and you can play against the computer or against anther player to see who is better. 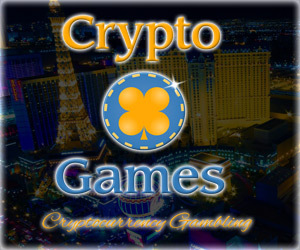 When you are ready you can register and deposit some coins and bet them on winning your game and if you manage to win you will get what the other player bet on the game. 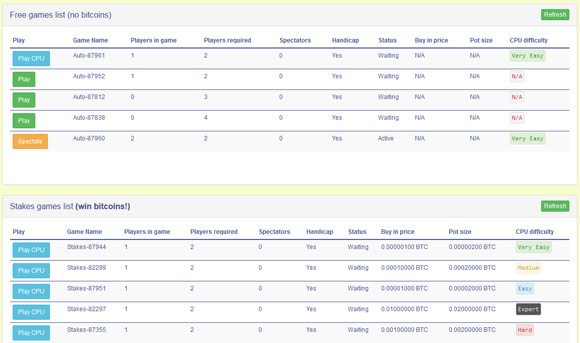 You can start with BTC as low as 100 satoshi and go up to 0.01 BTC per game. But then again before moving to actually winning some Bitcoins we do recommend to give the game a try in its free mode and test your skills. You can even join as a spectator and watch how other players battle each other in order to get a better idea on how to play your own games.